WASHINGTON — Over the weekend, the Democratic 2020 candidates again faced a familiar dichotomy as they tried to stand out in a crowded field: Pitching proactive messages of unity and optimism, while being reactive to the latest instance of President Trump elevating a particularly polarizing topic — in this case, Rep. Ilhan Omar's comments about 9/11. Booker, in Newark on Saturday, on social justice and "love": "Newark, Brick City, taught me about that love. It's not feel-good, easy-going love. It's a strong, courageous love. The kind of love that serves, the kind of love that sacrifices. The kind of love that is essential to achieving justice." Swalwell, in California on Sunday, on the nation's "promise" : "As someone who has benefited so profoundly from the promise of America, as someone who owes this country, this city everything, I'm asking you to help me create a country that fulfills that promise for all Americans." Buttigieg, in South Bend on Sunday, on "changing the channel" from the Trump era: "The horror show in Washington is mesmerizing, all-consuming. But starting today, we are going to change the channel. Sometimes a dark moment brings out the best in us, what is good in us, dare I say, what is great in us." That Buttigieg line about "changing the channel" sure sounds like an appealing one for the six-in-ten voters who express discomfort with Trump's 2020 reelection bid. But it won't be easy to play on anyone's turf but Trump's. Just think about the other political news story that dominated the weekend: Democrats responding to Trump's Friday tweet linking Rep. Ilhan Omar and the 9/11 attacks. Bernie Sanders: "Ilhan Omar is a leader with strength and courage. She won't back down to Trump's racism and hate, and neither will we. The disgusting and dangerous attacks against her must end." Beto O'Rourke: "This is an incitement to violence against Congresswoman Omar, against our fellow Americans who happen to be Muslim." Elizabeth Warren: "The President is inciting violence against a sitting Congresswoman—and an entire group of Americans based on their religion." Pete Buttigieg: "Now, a president uses that dark day to incite his base against a member of Congress, as if for sport. As if we learned nothing that day about the workings of hate." Kamala Harris: "For two years, this President has used the most powerful platform in the world to sow hate & division. He's done it again. Putting the safety of a sitting member of Congress @IlhanMN at risk & vilifying a whole religion is beyond the pale." Diving into a controversy involving a prominent Muslim isn't an unusual move for Trump; after all, he proposed a ban on Muslims entering the country, claimed to have seen "thousands" of Muslims cheering the 9/11 attacks, and posited that "Islam hates us." But here's our question: With a huge field of Democratic candidates seeking a breakout moment, what's most effective? A change of channel and a return to normalcy? Or taking the fight to Trump, wherever he dictates it will be? Speaking of Trump and 2020, we learned yesterday that the president's reelection campaign raised $30 million in the first three months of the year and has more than $40 million cash on hand. More, from NBC's Monica Alba: "Combined with $46 million raised by the Republican National Committee, the full Trump re-election effort is expected to have a grand total of $82 million in the bank, with the campaign doubling what it had at the end of last year… Trump's entire 2016 campaign brought in $333 million. At this pace, their second attempt will easily outraise that. Campaign manager Brad Parscale believes they may spend $1 billion this time around, which would be three times more than what it cost last cycle." Here's how that $30 million Trump campaign haul compares to what we know so far from the 2020 Democrats ahead of today's FEC deadline. That means that Democratic campaigns have raised a total of about $66 million in the first quarter, not counting Delaney's self-funding. As we wrote last week, Democratic fundraising has changed significantly over the last 12 years, with a new focus on small donors that's yielding — for now — far more individual donors but less money overall for campaigns. But don't be surprised if that combined Trump/RNC number prompts hand-wringing from some Democratic strategists worried about building a war chest to compete with a GOP that's still largely doing fundraising the old-fashioned way. Don't miss the pod from Friday, when we looked at how Democrats have pivoted away from the big bundler model of fundraising since the beginning of the Obama era. 2020 VISION: It's FEC deadline day! With campaigns due to submit their paperwork to the FEC by day's end, we'll be able to answer more questions about the money that candidates are raising — and spending. Who's spending the most? Does anyone else come close to Elizabeth Warren's more-than-85-percent burn rate? Are there any surprises among the second- and third- tier candidates? What about the candidates we haven't heard from at all yet? On the campaign trail today: Beto O'Rourke stumps in North Carolina… Bernie Sanders has an event with nurses in Pennsylvania and does a Fox News town hall that airs at 6:30pm ET… Elizabeth Warren and Jay Inslee are both in South Carolina… Cory Booker and Julian Castro are in Iowa… Eric Swalwell has a town hall in Nevada… and Howard Schultz has three events in Arizona. That's the percentage of former Maryland Rep. John Delaney's first quarter fundraising dollars that came from individual donors. 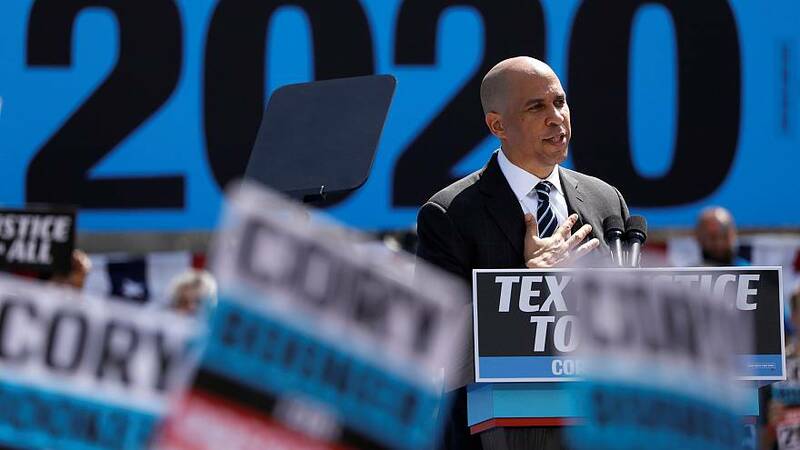 The Democratic presidential hopeful technically raised $12.1 million during the first quarter of 2019, but $11.7 million of that came in the form of a loan to himself. After cutting that big check, Delaney's campaign has $10.6 million in the bank. Delaney raised just $73,000 in small-dollar donations between January and March, as he hopes to bolster his debate credentials and reach the party's grassroots donor threshold. But this latest report confirms what we already knew about Delaney—the only thing making him competitive in the money chase right now is his own deep pockets. We also got a glimpse of another Democratic campaign's first quarter fundraising on Sunday when Kirsten Gillibrand's spokeswoman announced the campaign raised $3 million and now has $10.2 million in cash on hand. Unlike Delaney's numbers, which come from his official Federal Election Commission report, the Gillibrand numbers are self-reported, so there's still a lot we don't know. House Speaker Nancy Pelosi downplayed the divisions in her party during an interview on CBS' "60 Minutes"
Bernie Sanders is sparring with a liberal think tank he says is trying to "smear" his campaign.